"I combined several different recipes to create this one - it's definitely a winner. Serve sprinkled with chopped parsley." Fill a large pot with lightly salted water and bring to a rolling boil. Stir in fettuccine, bring back to a boil, and cook over medium heat until tender yet firm to the bite, about 8 minutes. Drain. Heat heavy cream and 1 cup butter together in a large saucepan over medium heat until butter is melted. Add Romano cheese, Parmesan cheese, 1 clove garlic, salt, and black pepper; cook and stir until cheese is melted and sauce thickens, about 5 minutes. Remove from heat. Heat remaining 1/4 cup butter and olive oil in another saucepan over medium heat. Add onion; cook and stir until softened and translucent, about 2 minutes. Stir in remaining 2 cloves garlic and mushrooms. Increase heat to medium-high and cook until soft, about 2 minutes. Add shrimp; cook and stir until firm and light pink in color, 1 to 2 minutes. Fold shrimp mixture into sauce. Add drained fettuccine; toss to coat with sauce. This pasta dish is brimming with shrimp, broccoli, and garlicky goodness. The sauce was watery but the taste was good. What could I do differently next time to thicken the sauce? This recipe is above restaurant quality. Best meal I have made in a while. 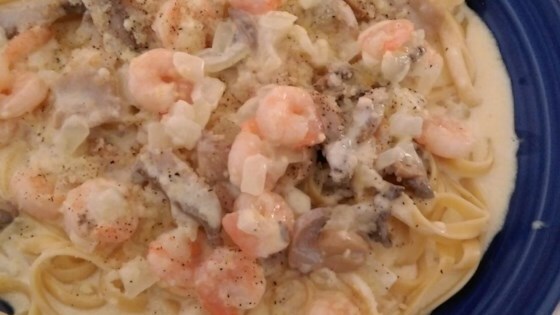 From now on, when I get a craving for alfredo, I will skip red lobster and go straight to the grocery store! I doubled the shrimp and added a few cups of sweet corn. All I had was parmigiano cheese so that's what I used. It turned out great. The kids destroyed plate after plate. I added a few bay scallops and about 3 TBSP of Sherry . We loved it and so did the neighbors we shared it with.